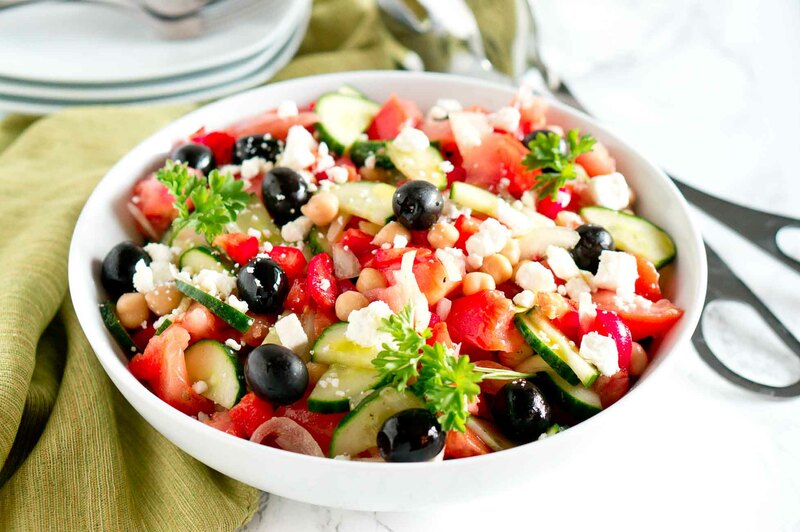 This Greek salad is brimming with flavor – loaded with delicious fresh vegetables, olives, chickpeas, and feta cheese tossed in a light and refreshing greek salad dressing. 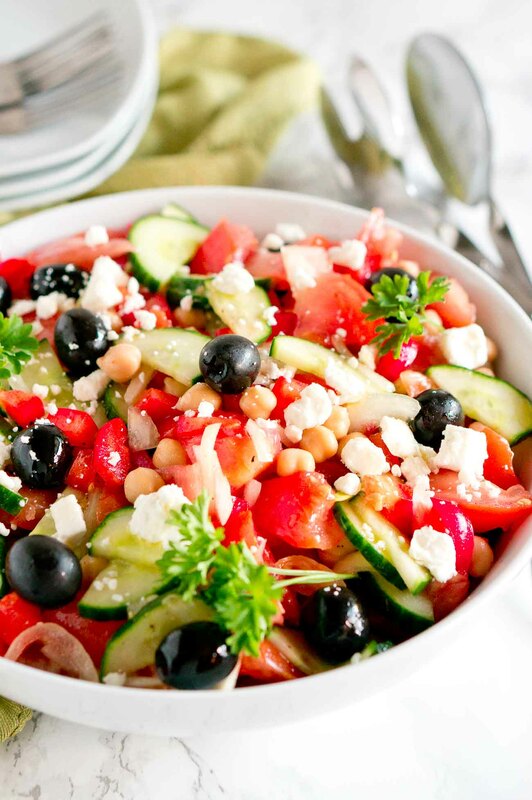 Greek salad or Khoriatiki salad is a salad in the Mediterranean cuisine. It’s a well-known classic salad which is common not only in Greece but also in the Mediterranean region. 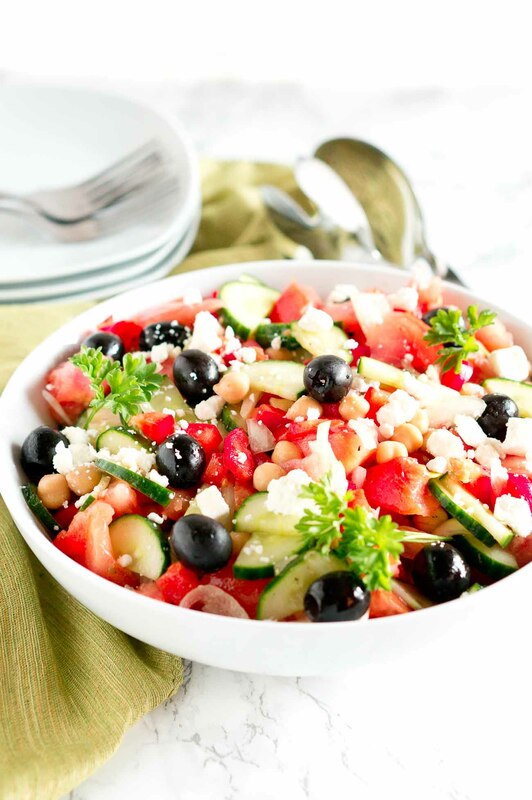 Greek salad is made with pieces of tomatoes, red bell pepper, sliced cucumbers, onion, chickpeas, feta cheese, and olives, typically seasoned with salt and oregano, and dressed with olive oil and vinegar. 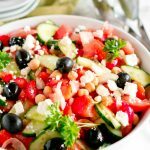 If you are looking for a quick and light side dish that everyone will love, make this Greek Salad. I make it for every potluck during the summer and everyone raves about it. It tastes amazing with fresh juicy tomatoes and cucumbers from the garden. It’s so light and refreshing. I grew up with Mediterranean cuisine and we used to eat this salad every single day in the summer – lunch, and dinner! It’s very easy to make this light and refreshing salad – it takes only about 15 minutes to chop the vegetables and toss them in a bowl with a light dressing. The hardest part about this salad is going to be getting the groceries. Scratch that, that’s not hard. Okay, the most time-consuming part of the salad assembly is going to be the chopping of the vegetables. I usually chop the tomatoes (you can use different varieties of tomatoes to add more color, texture and flavors) and bell pepper in bite-sized pieces, half the cucumber lengthwise and slice it, and thinly slice the onion. Because red onions can be quite sharp in flavor, some people recommend to soak them in vinegar or lemon juice for several minutes before adding them to the salad. I like their taste the way they are but if you prefer you can soak them first. A Greek salad wouldn’t be Greek without the olives and feta cheese. While most Greek salads call for Kalamata olives, you can also use black olives if that is your preference. I also like to use Bulgarian feta cheese because I find it’s creamier and tastier. But you can choose a feta cheese from any country if you like one better than the other. I love that this Greek Salad dressing is so simple to make yet it packs so much flavor! You don’t need fancy, hard to find ingredients for the dressing – just olive oil, red wine vinegar, parsley, oregano, salt and black pepper. Ingredients that you usually have on hand. I use this simple salad dressing as a go-to dressing on a lot of other salads as well. 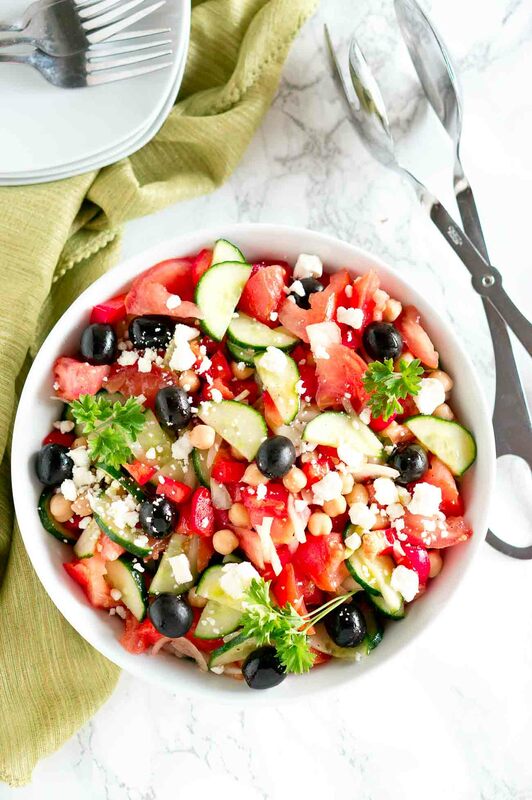 This Greek salad is brimming with flavor - loaded with delicious fresh vegetables, olives, chickpeas, and feta cheese tossed in a light and refreshing greek salad dressing. 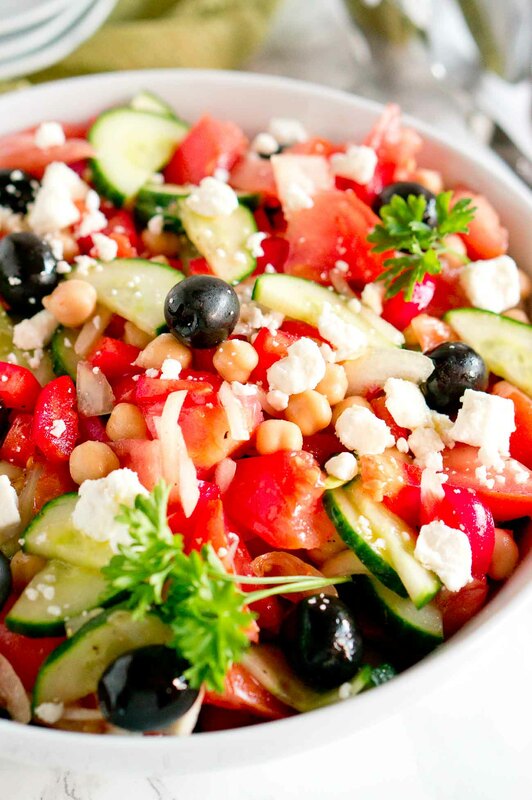 Place the tomatoes, bell pepper, cucumber, onion, olives and chickpeas in a salad bowl and toss gently to combine. Combine the salt, black pepper, olive oil, vinegar, oregano, and parsley in a small bowl, and mix. Pour the Greek dressing over the salad, add the cubed feta cheese and toss gently to combine. I agree! It is the Best Greek Salad. Chickpeas are a wonderful addition. I used white wine vinegar since I didn’t have red, I will have to try it with red. Thanks for this! Greek salads are my FAVORITE!! I’m definitely going to make this over the weekend! This salad is so colorful, and it looks like it is bursting with flavor! I can’t wait to try it! You can’t beat a classic Greek salad. We are a tonne of this when we were island hopping round Greece. This salad looks so fresh and delicious, and I love the the addition of chickpeas! You make vegetables and fruits feel so appetizing. I’m sure the feta and chickpea go really well. I’m saving this for later. This greek salad looks amazing! Perfect for all the veggies in season now. This looks incredible! Nothing can top greek salad! Do the chickpeas need to be cooked? I used canned chickpeas. This means they were soaked, not necessarily cooked, but soft. Hi…. I always thought Greek Salad also had lettuce, but this recipe does not call for it. Can lettuce be added? We often have salad for dinner with no meat or fish added to it. Hi Nancy, yes, you can add lettuce. I grew up in a Mediterranean country eating Greek Salad almost every day in the summer, and we usually didn’t add any lettuce, but I think it will be a great addition. Enjoy! Thanks so much for this recipe. I make a very similar one, but does not have chick peas or red pepper. Why didn’t I think of that!! I use a simple dressing of olive oil and lemon juice. Love red wine vinegar, so will try yours soon. I also add shredded of chopped chicken, so it’s an entire meal. Need to try it without! Thanks again! Now that it’s spring this will be a staple! !